By Angie Drobnic Holan on Wednesday, December 12th, 2012 at 6:00 a.m.
PolitiFact has selected Romney's claim that Barack Obama "sold Chrysler to Italians who are going to build Jeeps in China" at the cost of American jobs as the 2012 Lie of the Year. This marks the first year that the Lie of the Year is not about health care -- a reflection of the importance of the economy in the 2012 election. By 2012, Chrysler and other automakers were doing much better -- a fact that confounded Romney. In Ohio, a major expansion of its Toledo plant was in the works for the Jeep Liberty. In Detroit, the company was hiring workers to build the Jeep Grand Cherokee. But Chrysler was thinking of reviving the Jeep brand in key foreign markets, and like other American automakers, Chrysler preferred to build cars in the countries where it intended to sell them -- a common strategy to reduce tariffs and transport costs. But one conservative news outlet seized on the report’s opening lines. The Washington Examiner’s Paul Bedard blogged on Oct. 25 about the Bloomberg story and incorrectly wrote that Jeep was "considering giving up on the United States and shifting production to China," a move that would "crash the economy in towns like Toledo, Ohio … ." 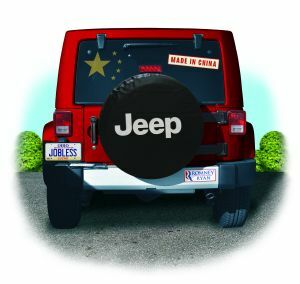 The conservative Drudge Report then linked to Bedard’s post under the headline, "Jeep eyes shifting production to China." There was no give from Romney. Maybe that wasn't surprising. At the Republican National Convention in Tampa, journalists had challenged the Romney campaign team about an ad that falsely claimed Obama was ending work requirements for welfare. Romney pollster Neil Newhouse responded by saying, "We're not going to let our campaign be dictated by fact-checkers." Obama’s campaign fired back with its own ad, which crowed that "Chrysler itself has refuted Romney's lie. The truth? Jeep is adding jobs in Ohio." Surrogates on the campaign trail, notably former President Bill Clinton and Vice President Joe Biden, mocked the ad as audiences roared with laughter. PolitiFact tried many times to reach Romney's top staff but received no response. In a post-election panel discussion conducted with both campaigns at Harvard University, Romney’s team insisted the ad had worked, that it had reassured voters in key Ohio markets. In an interview with PolitiFact, Obama strategist David Axelrod said the so-called "earned media" -- news coverage -- can easily outweigh the points made by paid political ads, especially when a campaign is in the final stretch. "The controversy surrounding the ad became a focus of news coverage," he said. "At the end of the campaign, when everybody is watching everything closely. … They just weren’t going to get away with it. It was a very high-risk strategy, and it backfired." — Mitt Romney, Monday, October 29th, 2012. See fact-check for full sources.